I must be in a little big of a Jane Austen spin off rut because I saw this book and I had to read it after reading AustenLand. This tells the whole story of P & P from Mr. Darcy's point of view. It's very well done and I liked it well enough for 4 stars. One thing that totally put me over the edge from 3 to 4 stars is in the last chapter or two of the book we get to see glimpses into the marriage of Mr and Mrs. Darcy. It's great. I love seeing how he softens up to her and knowing more of the story. It didn't always read like a diary and that sometimes quirked me a little funny. If you are going to write something as a diary, then write it as a diary, but there were major points in this book that I felt it didn't come that way. 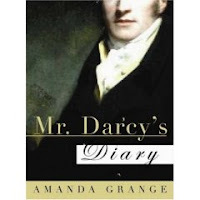 Just name it Mr. Darcy's point of view and write it that way. I know this is a small thing, but for some reason it really bothered me. It was cute though and if you love P & P then you will love this. I think it would make a great reading for a book club or any group of Austen fans.